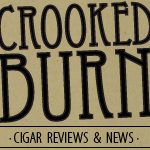 Today's review is a cigar blend that has received outstanding feedback from almost everyone who has smoked it, but in a size that has seemed to fly under the radar a bit. 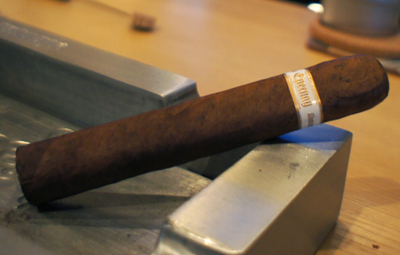 The Illusione Epernay Le Taureau was released around two months ago and is the second release of a box-pressed shape in this line. I've smoked my fair share the La Matin (the first box-pressed release) and have loved every one. Quote from Dion owner of Illusion Cigars about the new release: These new sizes were supposed to be a store-only exclusive cigar for my shop. I decided to let them out to others after I was sure the blend would perform well. As with all my new releases, I make very small quantities to ensure the blend is perfect before going in to larger production #'s. The first thing noticed when I held my Epernay Le Taureau was the nice shape. I am not normally a big box-pressed cigar guy, but this press wasn't overdone like so many others which feel a little like smoking a Lincoln Log. The wrapper was a medium to medium dark brown in color with some spalting effects in various places. The veins were minimal and it felt very smooth to the touch. 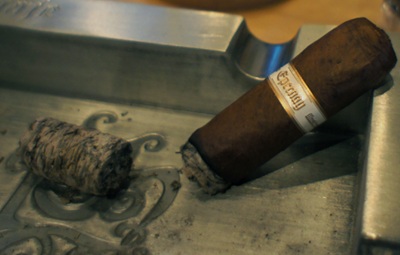 The pre-lit aroma was a mixture of sweetness and natural tobacco with the cold draw picking up a strong hazelnut flavor. Right out of the gate I felt like I was smoking an elegant cigar. The initial flavors were a mild peppery spice, especially on the finish with a warm, sweet raw honey taste on the front. The flavors were fantastic, but to me, the thing that set this cigar apart was the flavor balance. Neither of the flavors dominated the other and both showed their full potential on every draw. The construction was great and the burn razor straight. The strength of the cigar at this point was in the medium to lower-full range. The second third of my Epernay Le Taureau saw some changes in the flavor profile, but many on the finish, with the departure of the peppery spice and the arrival of some cedar. The front of each puff was still very sweet, but I would say it was more like a burnt sugar taste than a honey flavor. Again, the balance of the smoke and flavors were perfect and wonderfully enjoyable. Something else I want to add is how clean the smoke left your palate. This is a big cigar and it produced a lot of smoke, but at no point did I ever feel like my mouth was dirty or burnt. Toward the end of the second third, the strength started to show its teeth and I would say it was well into the full range. The final third of my Epernay Le Taureau was a clone of the second third with the flavors, but the strength bumped up even more. At this point I would say to anyone that this is a strong cigar and make sure you eat first. With that said, it is not overwhelmingly strong or sickening, just be careful to plan ahead. Everything else in the final third was perfect and I smoked this stick down until my fingers started to burn. 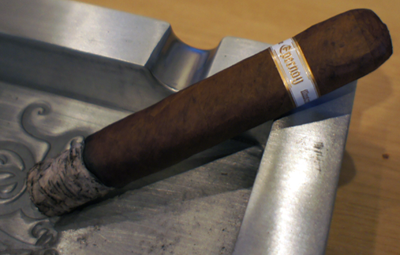 My final thoughts on the Illusione Epernay Le Taureau? I've said this a lot recently, but this is a Top 5 cigar of the year for me (sooner or later I'll have to make that list.) It's not the most complex flavor profile you will ever smoke and it's not the flashiest release of the year, but what it is, in my opinion, is the most well-balanced blend on the market today. The Le Taureau is just another perfect example of this blend. 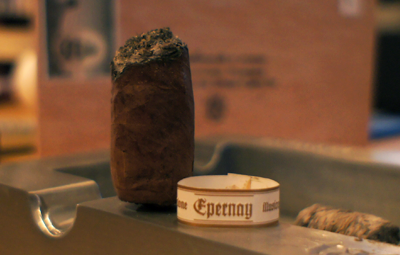 If you can find another cigar that has a more perfect marriage of spice and sweetness than the Epernay, please leave a comment and let me know what it is. Would I buy it again? All day every day. Lucky for me the only place that has them currently is New havana cigars which is located in my home town. I spoke to Dan (@nhcdan on twitter) about these cigars and he said he still had some left, but this first shipment was very small. Would I buy a box? This is a high priced cigar, but 100% box worthy cigar.